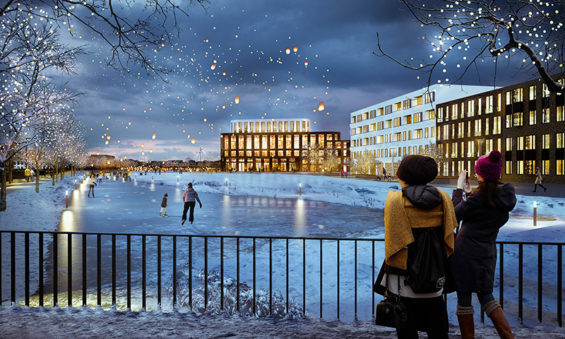 LEVS architecten and VLUGP have won an international competition for the design of a new residential area nearby the Russian city of Kazan. 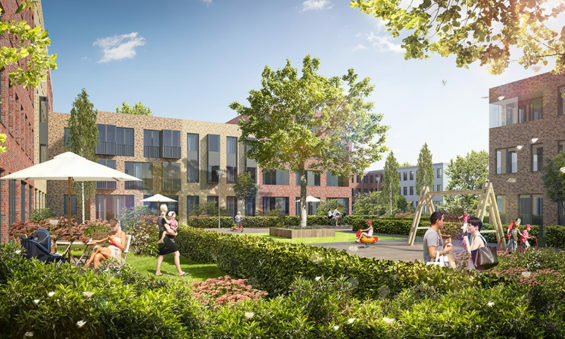 The winning master plan and architectural concept take a ‘Dutch approach’ to create a living environment for approximately 17,000 residents. Intimate dimensions, green spaces, informal bike paths and walkways, adequate facilities, and spirited architecture together make the Machaon Valley a sustainable community. 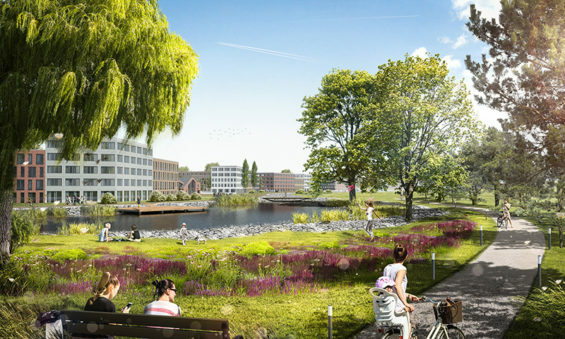 LEVS collaborated on the design of public spaces and landscapes with the Amsterdam landscape design office VLUGP. The 180 hectares competition-area borders on the old town of Malye Kabany, and lies twenty kilometers south of Kazan, capital of the Republic of Tatarstan. 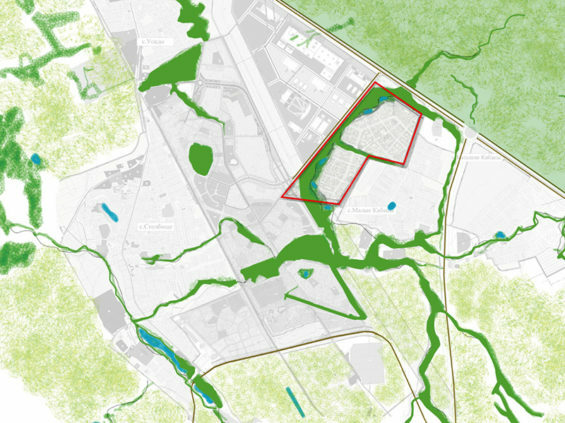 By 2025, the new neighborhood Machaon Valley is expected to be fully realized. Over the next few years, Unistroy and LEVS will together elaborate and realize both the master plan and its architectural content. The surrounding landscape is still largely open and green, but over the course of the next twenty years will be transformed into a lively urban environment, with various neighborhoods and business districts, and an infrastructure that connects the area to Kazan and the airport. These developments threaten the historically valuable landscape, with its many lakes and age-old ecology. LEVS and VLUGP negotiate this dilemma by integrating in the design such archetypal characteristics of the landscape as the rolling terrain and dry riverbeds, thereby honoring the area’s history and offering it a meaningful future. 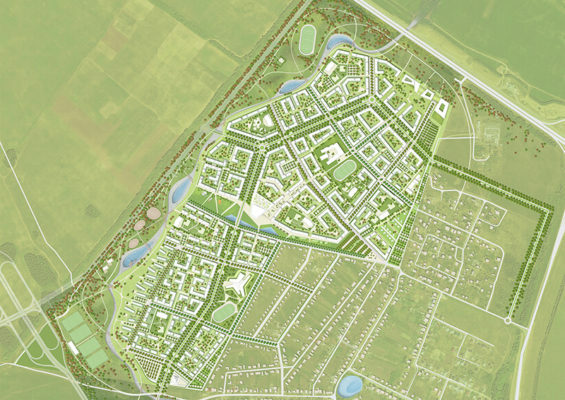 The Machaon Valley master plan blends seamlessly with the Tatar landscape’s orientations. 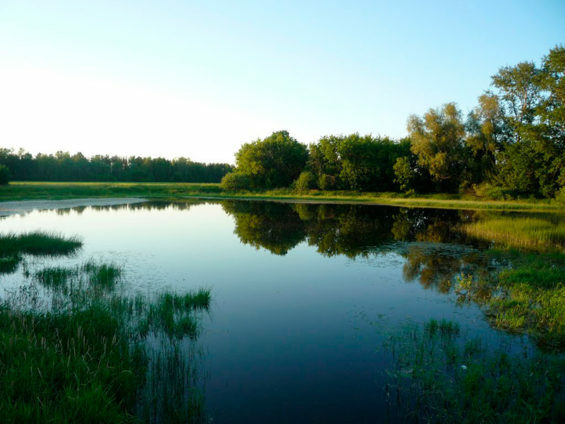 The old riverbed and its lakes naturally outline a landscape park, which simultaneously embraces the neighborhood, and connects it with the adjacent natural area northeast of the main road, not depending from future developments in the area. A second, urban park connects this green ‘corridor’ with the old town, and splits the new neighborhood in two. A Machaon is a wonderful butterfly, but rare in the region. 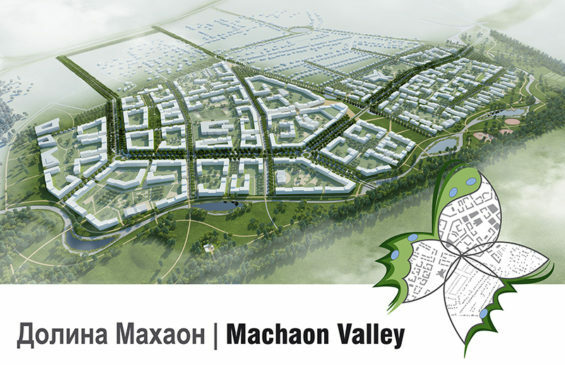 The name Machaon Valley reminds of the importance of a sustainable green living environment, where past and future meet. 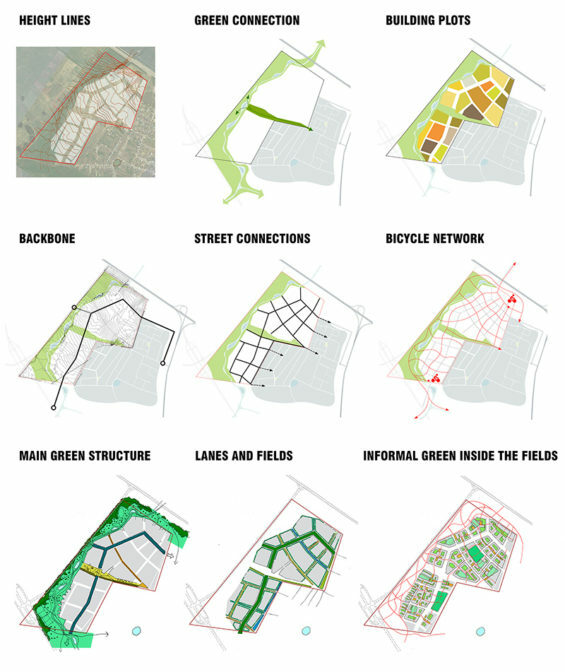 The integral design for Machaon Valley is compact and urban in scale. Housing is organized as closed- or half-open blocks of three to five storeys, which are grouped around central green courts. 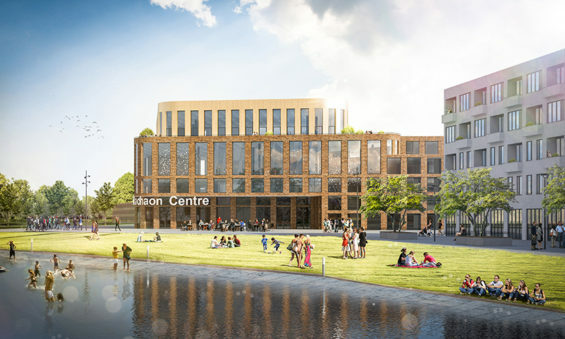 On top of residential buildings, the plan incorporates ample facilities, such as schools and daycare centers, shops, a community center with library and a small theatre. This international competition had been organized by developer Unistroy from Kazan. Their aim was the development of a new concept with which, in the coming years, Unistroy can begin to break with typical monotonous and isolated Russian neighborhoods of repetitive housing, and instead create high-quality living environments. 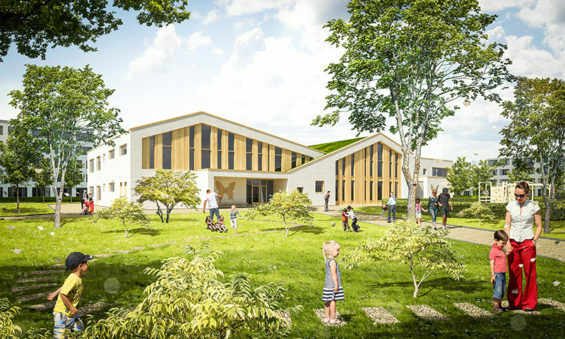 During the first round of selection, a jury picked three teams from eleven international architecture offices. 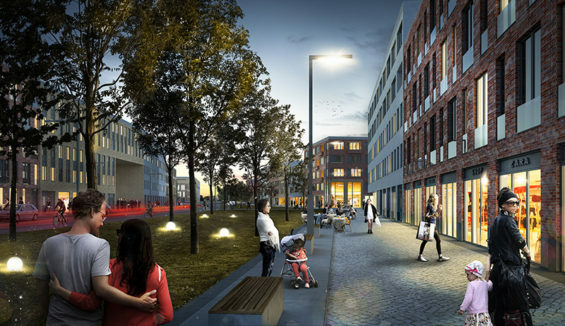 LEVS, a Spanish, and an English team developed their master plan and architectural concept for the second round, and presented these in Kazan on 9 February. Machaon Valley has recently been presented to the president of Tatarstan.